MUMBAI/NEW DELHI (Reuters) - In India, the world's second-biggest smartphone market, Apple Inc's (AAPL.O) normally deft management of government relations is being put to a fresh high-stakes test. 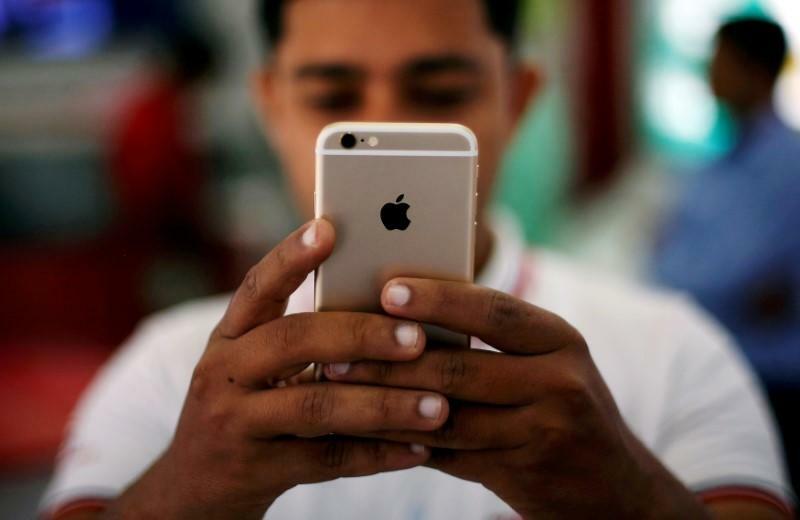 For almost two years, Apple has battled India's telecom regulator over a demand that it allow the use of the government's anti-spam app. Non-compliance, the watchdog threatened last month, could result in phones being "derecognized" from the country's networks, meaning they would no longer function. It is just one of several headaches the Cupertino, California-based company is nursing in India - a market it calls a top priority but where it has just 1 percent share. Apple has not gotten the tax breaks it has sought for suppliers to expand local manufacturing - key if it is to avoid steep import duties that have made its iPhones, already pricey for many Indian consumers, even more expensive. Local content prerequisites have also stopped the U.S. tech giant from opening its own stores. The lack of direct sales channels has helped make it vulnerable to discounting and prompted it to recently embark on a major overhaul of its retail strategy. At the heart of its latest tussle with the government is India's pervasive problem with spam and nuisance calls - one the Telecom Regulatory Authority of India (TRAI) is trying to counter with an app that it wants all phone makers to install. The new version of its iPhone operating system, expected in autumn, will allow many of the app's functions but not fully automatic spam filtering as that functionality could open the door to Apple users being tracked by third parties, Apple said in a letter to regulators. TRAI, however, last month notified Indian telecom firms it could give them six months notice to "derecognize" devices from their networks if the devices do not support anti-spam apps that are approved by the government. In the letter, dated June 18 and responding to a draft of the proposed notification, Apple asked for the clause about derecognition to be dropped. "We look forward to working with TRAI to address the issue of unsolicited commercial communications, while simultaneously ensuring that we fully honor our commitment to protect the privacy and security of our users," Apple's head of public policy in India, Kulin Sanghvi, wrote in the letter which was seen by Reuters. The Indian Cellular Association has also come out in opposition to the regulator's move. Asked by Reuters to respond to Apple's request to drop the derecognition threat, TRAI Chairman R.S. Sharma said the notification could not be quashed or challenged by writing a letter. "The most appropriate way to challenge this is in court," he said. Apple has also failed to find favor with Prime Minister Narendra Modi's administration when it comes to tariffs. Championing policies that force overseas tech firms to manufacture locally, the government has imposed import duties. A base model iPhoneX is now priced at nearly $1,400 in India - some 40 percent more than in the United States. Apple, which currently assembles only two low-end iPhones in India, has said tariff-free imports are critical for smartphone component suppliers and essential to make local manufacturing practical. But its pleas have gone unheeded and its competitors are not making the same arguments. Samsung Electronics <005930.KS> builds all its Indian phones locally and last month opened the world's biggest mobile manufacturing plant on the outskirts of New Delhi - which is slated to become an export hub. A key supplier for China's Xiaomi <1810.HK>, another major Apple rival, this week said it would spend $200 million to build a plant in southern India. The steep tariffs are exacerbating sales woes for Apple in India, where it has to rely on a network of distributors to supply devices. Competition among retailers has led to rampant discounting, at both physical stores and online, and Apple's policy to keep prices uniform within a single market has collapsed in India. It has also often meant a desultory buying experience for the consumer. Aiming to fix that, Apple appointed company veteran, Michel Coulomb, as its new India sales chief late last year and he has cut its national distributors from five to two. At a June meeting with around 20 of Apple's key distribution channel partners, Coulomb outlined a new program aimed at eliminating discounting and improving the shopping experience, a source familiar with the matter said. Other sources also said Apple aims to make financing plans that it offers in partnership with banks more attractive. But Apple is still some time away from opening its flagship stores in the country due to the requirement that direct sales outlets have 30 percent local content, a separate source added. The sources declined to be identified as they were not authorized to speak to media. Apple declined to comment on its sales and distribution strategy. Until Apple successfully tackles its regulatory and sales hurdles, its higher-end iPhones are likely to remain too expensive for many Indian consumers while for its older models, rivals have matched many of Apple's features at far lower prices. "The traditional appeal of the iconic Apple logo is gradually being challenged by the wow factor of a feature-rich, premium Android smartphone with the fastest processor or the best camera," said Tarun Pathak, an associate director at tech research firm Counterpoint.